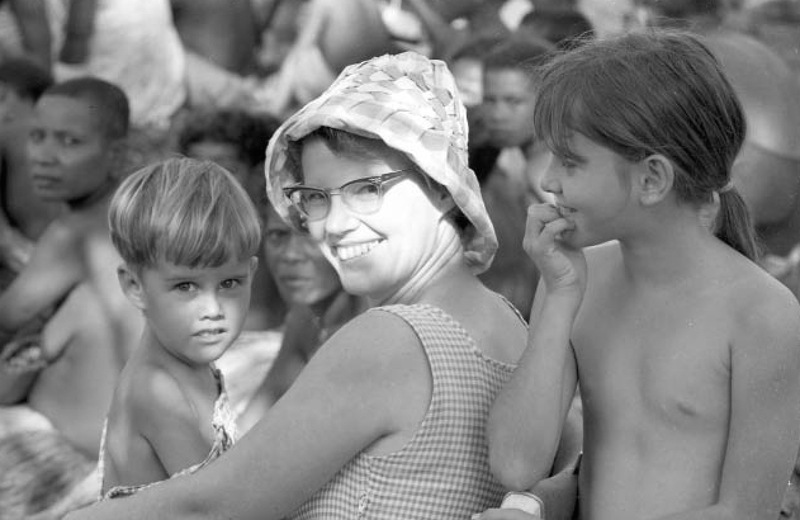 Caring for Kiriwina’s founder Margaret Lawton sits in a village with her children (Jenni, Doug (not visible) and David when they were living in Kiriwina in 1968. Margaret’s Grandpa Charles Ford, Grandma Eliza Ford and their daughter Lily Ford moved in 1915 from Adelaide (where he was a greengrocer) to take up new land in Moonah Bore. This was in the heart of the Mallee country. It had to be cleared, housing built, before anything else could happen. When John Davis came back from the War, Lily and he were married in 1919. John bought land on the other side side of the Peebinga-Meribah Road. There were 4 Davis kids born here, Laurel, John Clifton (Cliff ), Geoff, Alan and Margaret. Cliff joined the RAAF, and was sadly killed in action not far from the island of Kiriwina PNG Margaret and Ralph were to serve as missionaries many years later. Their house was stone with steps in the kitchen that led down to a large cellar underneath which Margaret remembered as ‘quite cool’. Monah Bore was a very hot and dry climate. Farmers could barely make ends meet there. There were rain water tanks and a windmill up on a small hill which gave water for animals and a bit of a veggie garden. She grew up there with severe frosts as well as heat waves. Their house had no power of course. So there were Kero lamps, candles in the bedrooms, a Coolgardie safe to try and keep milk and the home made butter a bit cooler. Home grown mutton was a staple. A poor rooster would lose it’s head at Christmas time. Lily had to make the bread in a wood stove. Sleepy Lizards slept under the old wheat bag used as a mat outside the door. Grandpa Ford leased a corner of his land near Moonah Bore for a school to be built which opened in 1926. Laurel and Cliff were among the first students, and Margaret was one of the last five when it was closed in 1942. It was quite a walk for Margaret across the neighbour’s paddocks, and she wasn’t always happy about some of the rams which might be in the paddocks! Life at Moohah Bore wasn’t easy. Petrol rationing during the war allowed them to drive to Meribah only once a week, and all the kids helped with duties such as milking the cows, feeding the chooks, bottle feeding lambs when necessary and so on. One of Margaret’s duties was to ride the horse out to the paddocks to bring in the cows for milking. However things got poor on the farm (they couldn’t afford to send 4th child Alan to Adelaide to High School), so as a family they moved to Clare at the end of 1944.
equivalent). Mum and Dad Ford retired to Adelaide about 1957. Margaret commenced Teachers College 1949. At this time she attended Maughan Methodist Church with brother Alan, who was now training for Methodist ministry. Here, everything was to change when she met Ralph who was also training for Methodist ministry. During her time at college she was given sixpence a day to cover transport for her teaching practicals. Instead of using the money for transport she rode her bike back and forwards and saved this generous amount for ‘tea with Ralph’. It seems that Ralph had little chance! Ralph was soon struck in awe at this beautiful vision who was, in his mind, ‘a genius’ doing BA majoring in Latin and French, while Ralph struggling to matriculate in Latin. After various meetings in the Uni library, the friendship ripened. Soon after Ralph graduated,’Fair Vision’ (as he called her), also graduated, and they were married on the 7th of January 1956. The Adventure of a Life time! The newly married couple moved to Sydney in March to train for mission service in George Brown College 1956. Ralph was required to do a Dip Ed at Sydney Uni, and Margaret did training in Tropical Medicine, Anthropology and Linguistics. It was Christmas in 1956, and the young couple set off by ship, sailing out from Pyrmont, under the Sydney Habour bridge, heading to Salamo, PNG. The introduction to PNG was far from smooth though. After changing ships at Samarai to the much smaller boat ‘Koonwara’, they encountered large swells at sea around Milne Bay, on their final leg of the journey. As she looked out at the mountains of water on each side, the horizon completely lost from view, she was heard saying ‘help… oh help’. However all Captain Arnold Willman of the Koonwarra heard was ‘hell… oh hell’, not the usual vocabulary of a new missionary’s wife! They arrived in Salamo the 7th January, the date of their first wedding anniversary. It must have felt like another planet for the girl from Moonah Bore. Stories abound of how they adjusted to this new world like the day they discovered strange fruits like Mangoes, and other tropical delights. This bold adventure began what was to become their life work. Ralph was to be head of a new Co-ed High School at Salamo. Because of Margaret’s teaching skills, she joined the school as staff, although Ralph was convinced they had this back to front, and that Margaret should have been head of school. in the region. As a result of these additions to the family, the new mum could not continue teaching. 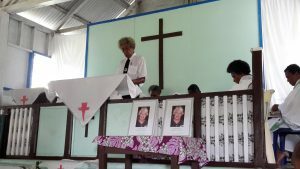 The Church Mission recognised Ralph’s growing ability in linguistics, and they were transferred to Dobu in 1960, then Kiriwina in 1961. The whole family moved to the island of Kiriwina in 1962, and it was here that their life call came into focus. 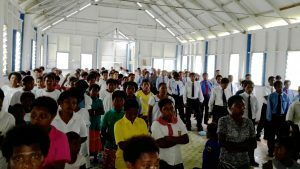 They went to a people who were culturally quite different to the rest of PNG, and where not many missionaries had lasted in what was to be known as a ‘difficult appointment’. Life was certainly not dull. While Ralph engaged in church administration and translation work, Margaret worked with pastors and their wives, especially when Ralph was absent, patrolling distant places. Ralph spent about 50% of his time away from home, so Margaret was virtually full-time in the overseeing of native pastors, while also supervising her (now) 3 children’s correspondence lessons. These three kids kept her busy, the adventurous and mischievous Jenni, the playful and resourceful Doug, and the very cute little David (who is himself a missionary now and wrote this biography). Many tales and stories abound here. In addition Margaret supported Ralph’s linguistic and translation work, and they accommodated many visitors who came to consult on translation and linguistic work. Around 1971-2 Ralph started full-time translation work, and Margaret’s secretarial skills added the ‘legs’ needed for this vast project. 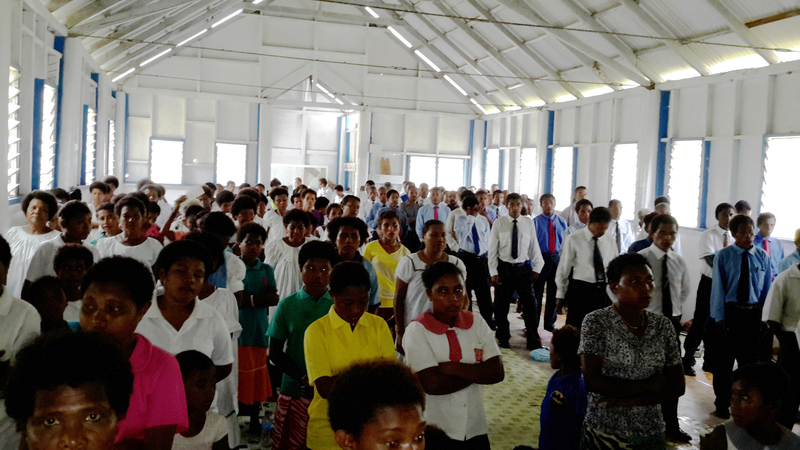 The translation of the Bible was to take 50 years of their lives, given as a sacrifice to the people of Kiriwina, and of course the Lord Jesus. In 1973 the family relocated to Canberra so Ralph could attend ANU for post-grad linguistic studies. She also worked on scripture portions in other languages including Solomon Islands, Tonga and Australian Aboriginal languages. Also of special significance was her role in production of Australian version of Good News Bible, sitting in your pews today. On her retirement, many letters testified to her editorial skills, including a personal letter from the Archbishop of Canterbury. Throughout this time and always close to her heart was theKiriwina translation. First came the Kiriwina New Testament in 1978 (Published 1984). 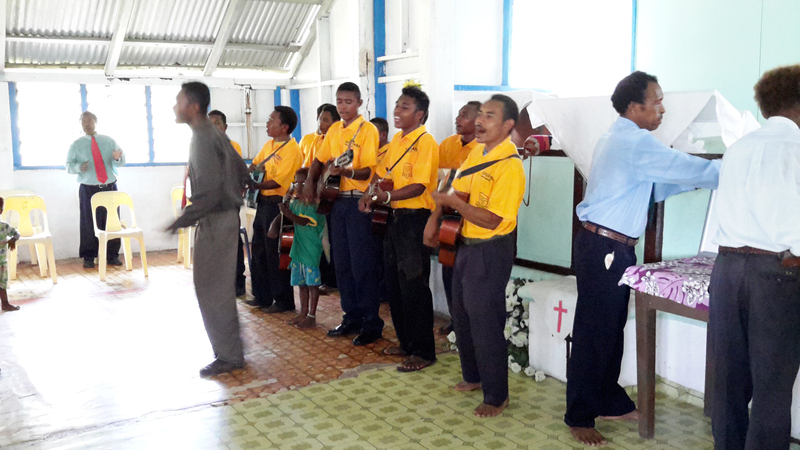 After being the ‘sent-ones’ to Kiriwina, now Kiriwina started to visit them! Margaret hosted Kiriwinan translators who came to Canberra to continue translation. As Ralph and Margaret had to navigate the huge cultural changes of PNG, so now Margaret enjoyed returning the favour, helping them adjust to this strange country called Australia. waited to see how the locals used the existing New Testament translation. During their 1982 return visit, they were encouraged to see the translated Bible in good use, so agreed to commence the Old Testament also. In that visit Margaret headed a committee of Kiriwina women who completed a translation of the book of Ruth; so it was really Margaret who began the Old Testament work, which continued until completion in 2008. 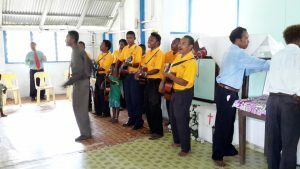 In 2012 the dedication of now completed Kiriwina Bible was presented with days of feasting, song and dances as the whole island celebrated the gift of the word of God in it’s entirety, for the very first time in their own language. It was a time of great joy! There is no other comparable document that has been translated into Kiriwinan. 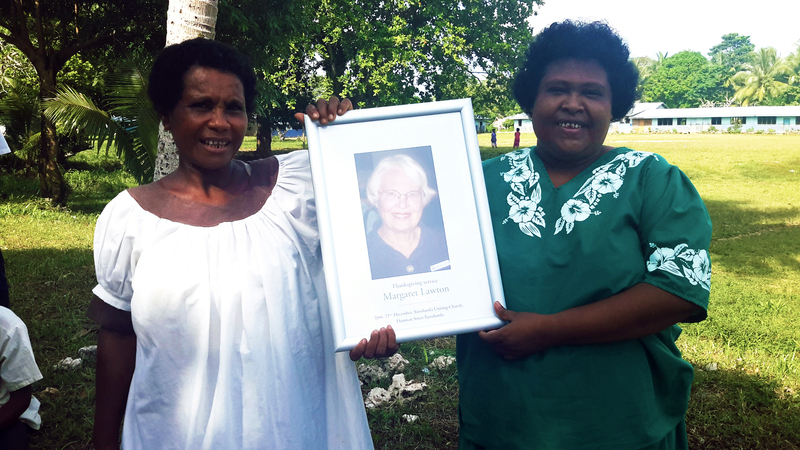 At the dedication service Margaret symbolically placed a copy of the new Bible in the hands of Kiriwina Tabalu chief Togarai of Mulosaida village. Bible Society continued for the rest of her life. She also served on the national executive of the ‘Australian Church Women’. 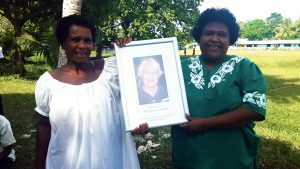 Her beloved community at Yarralumla Uniting Church was integral to her life, and also their support for the work in Kiriwina enabled them to do what they were called to do. Trips to Singapore, Malaysia and Indonesia with the Bible society, and to India to visit family were special to her. She loved her family, her garden, her marmalade and the many birds that came to her house, including some generations of Gang Gang’s that ate out of her hand. Family has been the fabric of her life, with two wonderful daughter-inlaws (Jodi and Colleen) and Jenni’s partner Simon. She has 8 grandchildren and 3 ‘great-grandies’. Doug and Dave were always near. In all things she served us and showed her love and devotion to God.